Smoked foods do not have to buy, so you can prepare them yourself. For this purpose, the country stands to make a homemade smoker, and any time you will be able to prepare delicious fish, meat, poultry, and even vegetables. - asbestos or metal sheets. Mark the location for the future of the smokehouse, it should not be far from home, but at the same time, note that the constant smoke can interfere with your family members. To manufacture a smoker, find a metal barrel and cut her bottom with tin snips. Dig a hole in the place where will be located the smokehouse, the diameter of the hole should match the diameter of the barrel, and the depth is about 400 mm. From the pit dig a trench of about 1.5-2 meters. At the end of the trench make a fireplace: dig a hole with a depth of 600-800 mm, overlaid it with bricks (leaving an exit for the smoke in the direction of the barrel). Set the barrel on bricks so that in the trench it could get smoke, the rest of the slit cover with soil. In the upper part of the barrel to arrange the bars for the products. For that, attach a few sticks across and place them on the prepared grill, or hang the products directly to the bars. Prepare the iron or asbestos cement sheets to close the hearth and chimney once the fire is steadily burning. Barrel top cover with burlap or other thick cloth so the smoke went at once. When the smoker is ready, do a control test. To heat it to remove odors from the barrel (if they were) and check the tightness of the structure. Please note, all the smoke must go through the pipe into the barrel, otherwise you will have to spend a lot more time and firewood for Smoking foods at home. You can do without a separately folded focus. Build fire directly on the bottom of the barrel, preferably from sawdust to avoid open heavy fire. 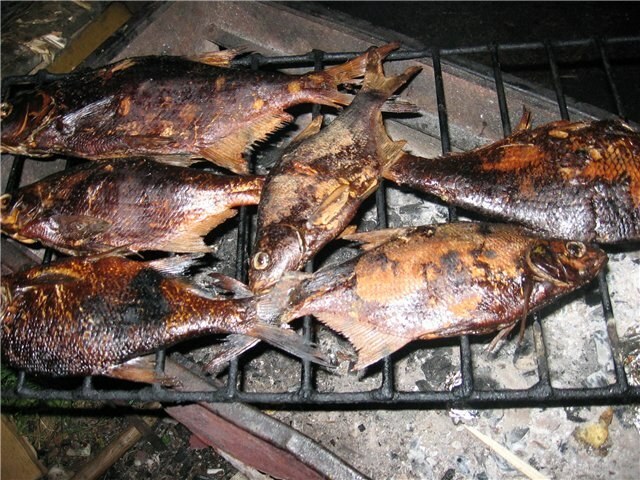 Note that in such a smokehouse is difficult to cook large hams or large bird, but a small fish it is possible to smoke. To ensure that this smoker was easy to put wood, make the bottom of the barrel a small door on hinges, just cut a square and fasten it with screws to one of the cutting edges.